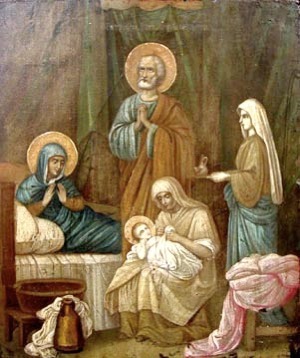 I wish you all a most blessed Feast of the Nativity of Our Lady! Archbishop Marcel Lefebvre wrote the above on July 29, 1976 to his friends (reproduced in Sel de la Terre 36, p. 10, as stated here). It is clear from these words that the Archbishop understood the Catholic Church and the conciliar “church” to be two formally separate entities even though they share material elements (e.g., members of the hierarchy). It is sad, however, that Bishop Richard Williamson has deviated from the Archbishop’s position on this significant matter. It is the purpose of this post to show the conciliarization of Bishop Williamson’s thinking regarding the Catholic Church. Before we begin, we must define some philosophical technical terms. These are all taken from the “Dictionary of Scholastic Philosophy” by Bernard Wuellner, S.J., published by the Bruce Publishing Company in 1956. 1. Substance (sense 1): being whose essence naturally requires it to exist in itself. 2. Substance (sense 2): loosely equivalent to essence and nature. 3. Substantial Form: the intrinsic incomplete constituent principle in a substance which actualizes the potencies of matter and together with the matter composes a definite material substance or natural body. 4. Substantial Change: change in the substance of a thing because of change of its substantial form. 5. Essence: what a thing is. 6. Accident (logical sense): an attribute belonging to some nature but not constituting its essence or a part of its essence. 7. Accidental form: an accident considered as a secondary or added perfection that determines a nature that is already substantially complete. 8. Accidental change: real change in the accidents of a being. I wanted to define these terms so that I could apply them to the Catholic Church. However, I must make clear that these terms will be applied to the Catholic Church only in an analogical sense. The Catholic Church is not a substance. It is a society (a perfect one) and societies are not substances. Nevertheless, we can think of the Catholic Church as a substance analogically in that we can say that it exists in itself (sense 1) and has an essence (sense 2). Furthermore, there is no other substance that has its essence. It is the one Church founded by Jesus Christ. The Anglican “church”, for example, exists in itself, but its essence is not the same as that of the Catholic Church since it was founded by a heretic. The same goes for all the other false “churches”, including the conciliar “church”. From philosophy and Church teaching, we know that the substantial form of man is the soul of man. Likewise, analogically speaking, we can say that the substantial form of the Catholic Church is the Holy Ghost, unchangeable Truth Itself. After all, the catechism teaches us that the Holy Ghost is the “soul” of the Catholic Church. On the other hand, the substantial form, analogically speaking, of the conciliar “church” is man. When the substantial form of a thing changes, the thing undergoes a substantial change. The substantial change results in a thing essentially different from the thing that underwent the substantial change. Likewise, again analogically speaking, if the substantial form of the Catholic Church were to change, it would be a substantial change, which would result in a “church” essentially different from the Catholic Church. For example, Archbishop Lefebvre affirms in the quote above that the conciliar “church” has “its new dogmas”, which make it “not Catholic”. Of course, a substantial change in the Catholic Church cannot happen because she is of the Holy Ghost and hence indefectible. What resulted instead at Vatican II, from the evil actions of the human element of the Catholic Church, is a heretical and schismatic “church”, the conciliar “church”, which is a separate entity from the Catholic Church. When an accidental form of a thing changes, the thing does not undergo a substantial change; rather, the change is accidental or non-essential. The thing before and after the accidental change remains the same thing but with an accidental difference. Likewise, analogically speaking, if an accidental form of the Catholic Church changes, it still remains the Catholic Church. For example, changes to Church laws regarding the election of a new pope are accidental. Let us now give a more concrete example to illuminate better the concepts defined above. A tree is a true substance. It exists in itself and has an essence. The substantial form of a tree is what makes the matter to be a tree and not something else. If a tree (think about any particular tree) were to catch on fire, the portion that is being consumed by the fire undergoes a substantial change from “tree” to “ash”. The ash has a different substantial form than the tree; hence, the essence of the ash and tree are different. On the other hand, when the same tree buds leaves in the spring and loses them in the autumn, the tree undergoes only an accidental change; hence, only the accidental form is affected. Throughout the whole process (spring to autumn), the tree remains a tree. As an apple oxidizes, it undergoes a substantial change from “apple” to “rot”. The rot has a different substantial form than the apple; hence, the essence of the rot and apple are different. Bishop Williamson, understanding this, distinguishes the apple (Catholic Church) from the rot (conciliar “church”) as two different substances (in both senses defined above). Of course, we have to keep in mind again that the Catholic Church cannot undergo a substantial change. The analogy, as with all analogies, is imperfect. A faithful adherent to the position of Archbishop Lefebvre knows that Tradition and the followers of Tradition, objectively speaking, are the Catholic Church. However, from the portion of the above paragraph that I have placed in bold, we should see that His Excellency has shifted his thinking regarding the relationship between the Catholic Church and the conciliar “church”. For if the “Traditional movement” (followers of the Archbishop) is only that, a movement, within the larger structure of the Catholic Church, then it stands to reason that the rest of the Catholic Church is composed of the conciliar “church”. 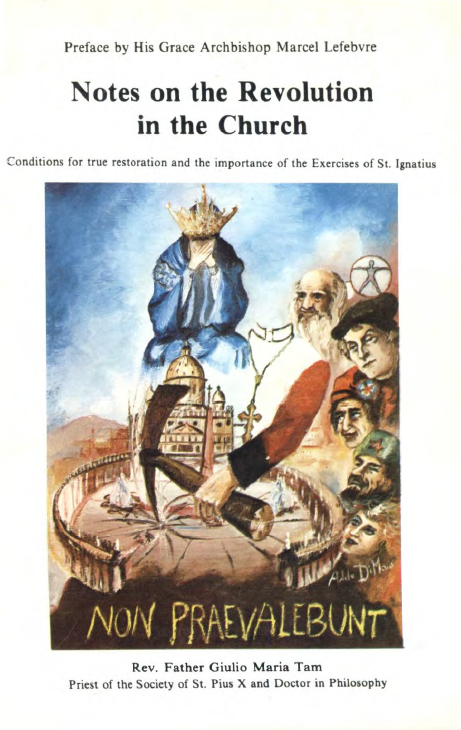 It is therefore no longer that the apple (Catholic Church) and the rot (conciliar “church”) are two different substances (in both senses defined in the beginning); rather, the conciliar “church” (rot) forms an essential part of the Catholic Church (apple), along with the Traditional movement. Note here that the analogy has shifted from one thing being substantially different from another thing (in both senses of substance defined in the beginning) to one thing forming an essential part of another thing. The latter would be akin to stating that the rational soul forms an essential part of man. Nevertheless, the point I am trying to make is that His Excellency used to clearly distinguish the relationship between the Catholic Church and the conciliar “church” as substantially different (in both senses of substance defined in the beginning). Now he makes the relationship between the two of one (conciliar “church”) forming an essential part of another (Catholic Church). All rot is a transformation of some apple, a corruption…….resulting in something essentially non-Catholic which no Catholic in his right mind would call Catholic or want to associate with, on pain of losing his faith. The impression is that rot (conciliar “church”) and apple (Catholic Church) in 2014 are substantially different (in both senses of substance defined in the beginning); in 2017, they are accidentally different (or as mentioned earlier, that the conciliar “church” forms part of the essence of the Catholic Church). Even though His Excellency doesn’t go into more detail in this issue on how the rot (conciliar “church”) of an apple (Catholic Church) is and is not apple, we can prudently state, based on what he wrote and said earlier in the same year, that the difference between the conciliar “church” and Catholic Church is not substantial (in both senses of substance defined in the beginning). Furthermore, it would not make sense to state that “the rot of an apple is apple” if the difference was intended by His Excellency to be qualified as substantial (in both senses of substance defined in the beginning). To conclude, I have shown the conciliarization of Bishop Williamson’s thinking regarding the Catholic Church. As such, His Excellency has deviated from the Archbishop’s position on a major point in the fight for Catholic Tradition. 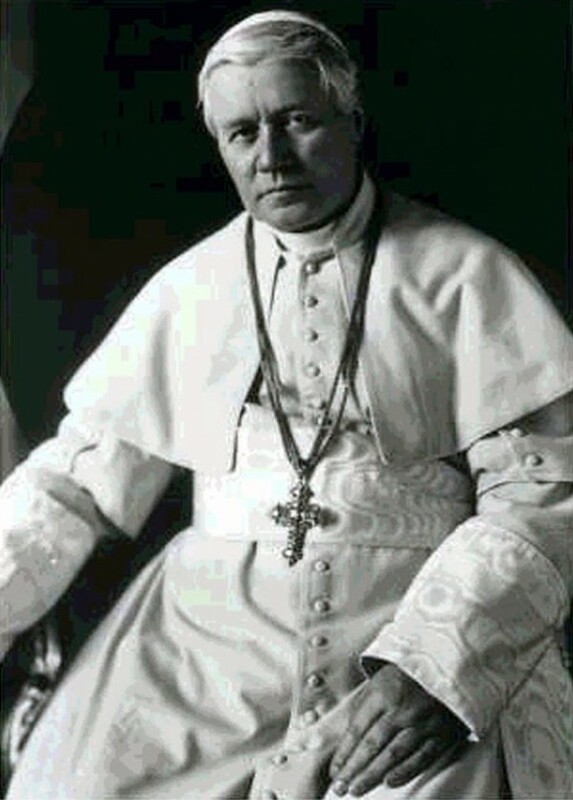 I wish you all a most blessed Feast of Pope St. Pius X! He is one of the greatest popes in the history of the Church. What is the true mission of the Ecclesia Dei Commission? It is to bring souls into the conciliar church. We must therefore reject it and the pseudo-traditional religious societies under its wing. Read the August 2017 issue of the Cor Mariae Newsletter to learn more.